13 years in areas of Design, Design Thinking, Innovation, Creativity + interdisciplinary areas. At WeSchool he has lead and managed design programs, and initiatives BD Start Inc., Wemrash, InnoManthan Series, Design Thinking Workshops etc. He has also taken up consulting assignments with industry and design thinking workshops for corporate executives at various levels and varied domain expertise. He has been invited as resources on various forum to speak on design and innovation. He has been Head - Dept of Design, MSRUAS, Bangalore running successfully masters progamme in affiliation with Coventry University UK at MSRSAS Bangalore. He was instrumental in organizing various design shows such as Design First Conference, Ankur, Deeksha Design degree show. He has mentored around 300 product designers, who are well placed in Industry. 13 years of global and Indian Industry experience in areas of Design, Product Design and Development, Industrial Design. His area of expertise is in product design, development and management. He has credit of designing numerous consumer products as Industrial designer. He has lead Media Trans European research project identifying emerging trends/needs in Indian SME sectors in TV, Print, New Media, and Radio. He has worked in the software industry as software consultant across USA for IBM, ATT and eConnect, LA, USA. 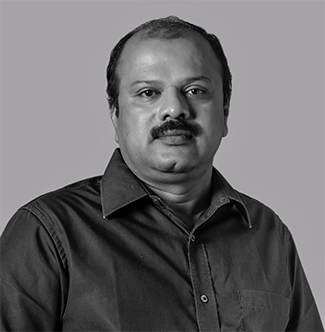 He has also worked as an Industrial Designer in India/abroad, designing numerous consumer products.